This beautiful print is a faithful yet romantic portrayal of one of the great state occasions of late Victorian England. The opening of Tower Bridge in June 1894 was a grand display of British imperial might: with the bridge’s bascules uplifted, and an extravagant display of flags and drapery on show, an imposing procession of ships passed through. Those pictured here include the Trinity House yacht Irene, the gunboat HMS Landrail, the Bismarck and the Clacton Bell.The artist was commissioned by The Graphic magazine to record the bridge’s opening for its next issue. Through his close friendship with the bridge’s architect, Sir John Wolfe-Barry, Wyllie secured a seat on HMS Landrail, one of the first ships to be given the privilege of passing through the bridge. He initially produced a black and white drawing for The Graphic; this was soon after developed into the stunning oil on canvas work shown here.This painting was first exhibited at the Royal Academy in 1895, and was an immediate success. One reviewer wrote: ‘Mr Wyllie found here all that his heart could desire – the close-packed flotilla of shipping, the race of the mighty river tide, the avenue of unpaintably brilliant and varied flaunting bunting, which led up to the mighty bridge standing white midstream in the westering sunlight...Here was a subject for an historical painter, and in that sense he has conceived and executed it.’ The work is currently in the collections of the National Maritime Museum. 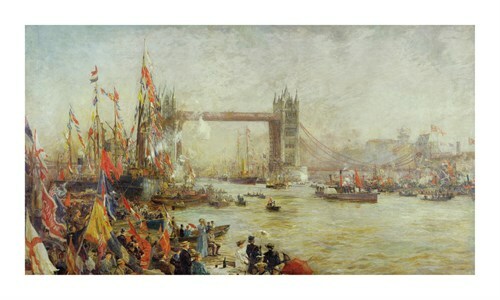 The marine painter W L Wyllie was born in London on 5 July 1851 and made his name as an extremely successful painter of maritime scenes in both oil and watercolour. He was the son of William Morison Wyllie, a genre painter, and brother of another successful artist, C W Wyllie. He studied art at Heatherley’s and subsequently at the Royal Academy Schools between 1866 and 1869, where he won the Turner Medal in 1869. His work was exhibited at the Royal Academy from 1868; he was elected a Member of the Royal Institute of Painters in Water-colours in 1882 and was also elected to a number of other prestigious bodies, including the Royal Academy in 1907. Wyllie’s obsessive love of the sea embraced every type and size of vessel, and also inspired him to cover every aspect of the working river, which was an unusual theme at the time. His semi-circular panorama of the Battle of Trafalgar is now kept in the Royal Naval Museum, Portsmouth, and on his death the watercolours in his studio were purchased for the National Maritime Museum at Greenwich. One of Wyllie’s last tasks was his work as a member of the committee supervising the restoration of HMS Victory to her Trafalgar state. As well as painting, W L Wyllie wrote “J M W Turner” in 1905 and “Marine Painting in Watercolour”, as well as a number of other books. He lived in Portsmouth for many years from 1907 and died in London on 6 April 1931.